The news today is full of Trump’s spat with Khizr Khan, who appeared at the Democratic national convention and who was the father of an American Muslim soldier who died in Iraq. This has caused a media storm of hysteria, even though I think Trump’s comments are pretty subdued by his standards, and there is an obvious issue that really stinks here: Democratic and American liberal hypocrisy. (1) Hillary Clinton supported the Iraq war – the illegal war that killed 100,000s of people, led to a Sunni versus Shiite civil war in Iraq, unleashed a catastrophic insurgency, and that has destabilised the Middle East and helped to fuel the global Islamist nightmare that is tearing many countries apart. Maybe if Democratic shills like Hillary Clinton hadn’t supported Bush’s war, then it wouldn’t have happened? Maybe, you know, Mr Khan’s son wouldn’t have died? (2) Hillary supported a disastrous Libyan intervention that killed thousands and left that Muslim country in chaos. (3) Hillary supported the destabilisation of Syria and America’s catastrophic support for mass murdering Islamist rebels in Syria (see also here). Even now this vicious warmongering woman is calling for further military attacks on the Assad regime, which, as bad as it is (and nobody well-informed doubts it is a bad regime), is nevertheless the only thing holding back a tidal wave of genocidal Islamist mass murder in Syria. Seymour M. Hersh, “The Red Line and the Rat Line,” London Review of Books 36.8 (17 April 2014): 21–24. Fortunately, this was called off at the last minute, but the Democrats under Obama were about to unleash another criminal war in the Middle east that would have killed thousands. So, wait a minute, Hillary Clinton – the corporate shill and neocon-lite warmongering queen of chaos – can support a really vile and grotesque foreign policy that tears the Middle East to shreds, and kills 100,000s of Muslims, but Trump is the hateful, racist bigot just for calling for a temporary halt to Muslim mass immigration? I don’t even care what you think about Trump, but the US Democratic party is a cesspool of war, moral depravity and hypocrisy. Michael Lind, “The Neocons Are Responsible for Trumpism,” The National Interest, March 7, 2016. 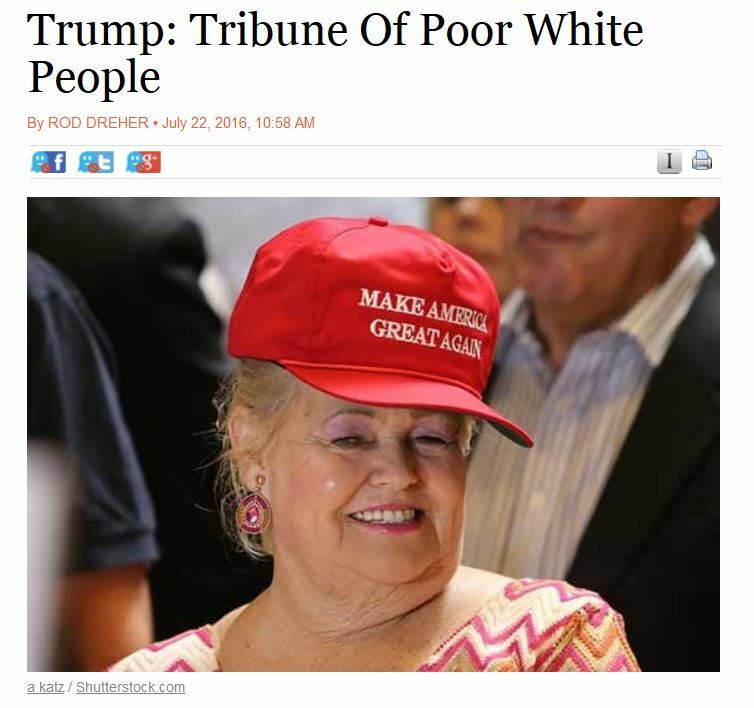 Rod Dreher, “Trump: Tribune of Poor White People,” The American Conservative, July 22, 2016. Michael Lind, “How Trump Exposed the Tea Party,” PoliticoMagazine, September 3, 2015. Michael Lind, “Donald Trump, the Perfect Populist,” PoliticoMagazine, March 9, 2016. I was particularly struck by Dreher’s article here, which describes the real and terrible experience of white working class Americans, the catastrophe of neoliberalism, and the vicious, elitist snobbery and hatred of the working class. Yes, this is probably how a lot of poor white voters in America destroyed by neoliberalism and demonised by cultural leftism see Trump, even though Trump would have much less to offer them than a decent social democrat capable of making a clean break with the worst aspects of cultural leftist nonsense. 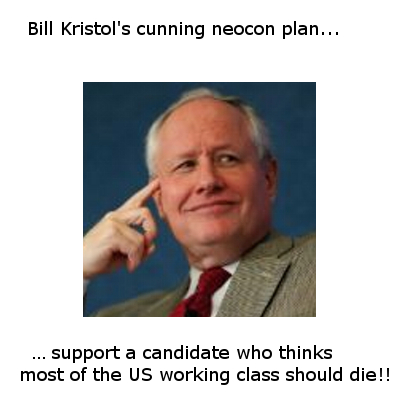 Yes, this is the new propaganda line over at the Weekly Standard, Neocon Central. Seriously, dudes, Neoconservatism is dead. Get over it. This political collapse of libertarianism, quasi-libertarian and traditional consensus neoliberal economics in the GOP is the unnoticed story of the last year. The only serious party for a libertarian or quasi-libertarian President of the United States is the GOP. And Trump’s victory has killed this, given Trump’s hatred of free trade, his love of protectionism, and his abandonment of the standard quasi-libertarian GOP issues like privatisation of Social Security. Even the libertarianism of the Tea Party movement seems to be collapsing as the Tea Party people come to support Trump. Go figure. It looks like the – umm, how shall I put it? – full-retard economics of libertarianism was never that popular with the Republican base. They just needed the right person to make them discover their love of Big Government and conservative socialism. That person was Trump. It turns out too that the Republican base seems to be sick and tired of the endless Neoconservative warmongering that has been going on since 2000. See the excellent analysis of these issues by Michael Lind here with these criticisms here. More astonishing still is that there seems to be some evidence that many former Ron Paul-style libertarians have morphed into Alt Right neo-fascists. But, as we see, the Alt Right “refutation” of libertarianism seems to have little to do with the economic flaws in libertarian theory. Rather, it seems to be more in line with Hans-Hermann Hoppe’s critique of standard libertarian theory along with intense white nationalism and identitarianism, anti-Semitism and racial issues peculiar to the United States. So this is yet another story people have missed: the emergence of neo-fascism in America, even if it is just a fringe movement, seems to have come via libertarianism. Creepy. An older talk but still interesting. Time to stop lying, leftists. Stop being cowards. (2) Hillary Clinton is a corporate shill, neocon-lite warmonger, and historical supporter of most of the things people hate in (1)? But you won’t know it from the weird Hayek apologists and Free Bankers who have essentially rewritten history to make it seem as if Hayek was in favour of MV stability by monetary stimulus and central bank intervention during the early years of the Great Depression (see here for a full discussion). Not too long ago I had a run in with some of the Hayekian True Believers on Twitter. One of them cited the second part of Hayek’s review of Keynes’ Pure Theory of Money (see Hayek 1932; the first part of the review is Hayek 1931), in order to prove that Hayek was definitely in favour of monetary stimulus and was not a nasty liquidationist. “I do not deny that, during this process [viz., the slump], a tendency towards deflation will regularly arise; this will particularly be the case when the crisis leads to frequent failures and so increases the risks of lending. It may become very serious if attempts artificially to ‘maintain purchasing power’ delay the process of readjustment – as has probably been the case during the present crisis. This deflation is, however, a secondary phenomenon in the sense that it is caused by the instability in the real situation; the tendency will persist so long as the real causes are not removed. Any attempt to combat the crisis by credit expansion will, therefore, not only be merely the treatment of symptoms as causes, but may also prolong the depression by delaying the inevitable real adjustments. It is not difficult to understand, in the light of these considerations, why the easy-money policy which was adopted immediately after the crash of 1929 was of no effect. valuable suggestions for treating these secondary complications. But, as I suggested at the beginning of these Reflections, his neglect of the more fundamental ‘real’ phenomena has prevented him from reaching a satisfactory explanation of the more deep-seated causes of depression.” (Hayek 1932: 44). That is very explicit: “Any attempt to combat the crisis by credit expansion will, therefore, not only be merely the treatment of symptoms as causes, but may also prolong the depression by delaying the inevitable real adjustments.” Crystal clear. As late as the second edition of Prices and Production (1935), Hayek was still saying that “we can do nothing to get out of ... [sc. a depression] before its natural end” (Hayek 2008 : 274–275). Hayek is defending the Austrian Business Cycle Theory (ABCT) here, and its liquidationist solution to depressions. So Hayek changed his mind after he started to believe in the existence of “secondary depressions,” and then came to advocate monetary and eventually even fiscal interventions as a correct response to “secondary depressions” or “secondary deflations,” particularly when he came to accept the severity of downwards nominal wage rigidity in modern capitalist nations. And by the time of Hayek’s 1937 essay “The Gold Problem” (“Das Goldproblem” in German; see Hayek 1999: 169–185, and 184), Hayek is found actually endorsing, not just MV stability, but deficit-financed public works as a response to depression (see here). I don’t think people appreciate the full extent of Hayek’s humiliation, volte face and capitulation to Keynes on these issues today (even if this was only a strategic move by Hayek at the time). But Hayek clearly wasn’t saying these things in 1930, or 1931 or 1932. At that time, Hayek was indeed a liquidationist in any meaningful sense of the term. Hayek, F. A. von. 1931. “Reflections on the Pure Theory of Money of Mr. J. M. Keynes,” Economica 33: 270–295. Hayek, F. A. von. 1932. “Reflections on the Pure Theory of Money of Mr. J. M. Keynes (continued),” Economica 35: 22–44. Hayek, F. A. von. 1999. “The Gold Problem” (trans. G. Heinz), in S. Kresge (ed. ), The Collected Works of F. A. Hayek. Volume 5. Good Money, Part 1. The New World. Routledge, London. 169–185. Hayek, F. A. von, 2008 . Prices and Production and Other Works: F. A. Hayek on Money, the Business Cycle, and the Gold Standard. Ludwig von Mises Institute, Auburn, Ala.
“In our days the English legislation not having separated German agriculture from the British manufactures, Germany, with a progress of twenty years in an industrial career achieved at immense sacrifices, would he blind to allow herself to be diverted by the repeal of the English laws from the great national object she is now pursuing. We have, indeed, a firm conviction that Germany, in that case, ought to increase her duties as compensation for the advantage which the repeal of the corn laws would give to the English over the German manufacturers. For a long time to come, Germany can adopt no other policy toward England than that of a manufacturing nation yet far behind, but exerting all her energy to overtake, if not surpass her rival. Any other policy would endanger German nationality. If the English need corn or timber from abroad, whether they import from Germany or any other country, Germany must not strive less to preserve the advantages which her industry has already obtained, and to secure a greater progress in time to come. If the English are unwilling to receive the wheat and the timber of Germany, so much the better; her industry, her shipping, her foreign trade will increase the faster, her system of internal communication will be improved the sooner, and the German nationality will acquire the more certainly its natural basis. It may be that corn and timber in the Baltic provinces of Prussia will not advance in price as promptly in this case as if the British markets were immediately opened; but the improvement of the means of communication at home, and the demand for agricultural products, created by home manufactures, will proceed with a degree of rapidity far from unsatisfactory, in a market established in the very centre of Germany, a market not only established, but made permanent forever no longer oscillating, as heretofore, from one decennial period to another, between famine and abundance. With respect to power, Prussia, in pursuing that policy, will gain a real influence in the interior of Germany, of an hundred times greater value than the sacrifices made in her Baltic provinces; but she will merely have made a loan to the future at a heavy interest. It is obvious that by means of this report the English ministry meant to obtain admission into Germany for the common articles of wool and cotton, either by the suppression or the modification of our specific duties, or a diminution of the rates, or by the admission into the English market of German corn and timber; this would be making the first breach in the protective system of Germany. The articles of general consumption are, as we have shown, by far the most important: they constitute the basis of the national industry. With a duty of ten per cent. ad valorem, as demanded by England, and the undervaluations which always attend the ad valorem system, German industry would be almost wholly sacrificed to English competition, especially in times of commercial crisis, when the English manufacturers are obliged to dispose of their goods at almost any price. There is no exaggeration in averring that the propositions of England tend to nothing less than the overthrow of the whole system of German protection, with a view to reduce Germany to the condition of an agricultural colony of England.” (List 1856: 469–470). Now it is true that tariff protectionism, while it was used in Germany in the early and middle 1800s, was used to a far lesser extent than in America, nevertheless German protectionism in the18th and 19th centuries that forced industrialisation was significant. First, the foundation for German industry had been laid in the late 18th century by a Prussian program of creation of cartels and monopoly rights, export subsidies, bringing in of experts on industry as well as skilled labour, and the outright conquest of Silesia from Austria, a stronghold of industry (Chang 2002: 33). The Prussian state program of industrialisation was continued in the early 19th century, under the Minister of Mines Friedrich Wilhelm von Reden (1752–1815) and Christian Peter Wilhelm Friedrich Beuth (1781–1853) (Chang 2002: 34). Even the Prussian-led Zollverein (1834–1919), although it created a free trade zone within the area that would become the German empire, had a distinctly protectionist phase in the 1840s and 1850s (Bairoch 1989: 30–31). After the 1840s and the proclamation of the German empire in 1871, Prussia continued its program of industrial subsidies, promotion of cartels and a highly successful system of higher education focussed on the sciences and engineering (Chang 2002: 35). Despite a free trade interlude between 1862 and 1878 (Henderson 1975: 213), it was actually the case that the new German empire increased tariffs from 1879 until 1885, especially on iron and steel (Skarstein 2007: 358, n. 11; Chang 2002: 33; Feldenkirchen 1999: 98–99), once these industries started to feel the effects of free trade. Other notable policies were that, between 1879 and 1895, the Prussian state nationalised nearly all its railways, and nationalised railways existed in seven other German states (Henderson 1975: 210–212); the profits from nationalised railways were an important part of government revenue, and so of public investment. Bairoch, Paul. 1989. “European Trade Policy, 1815–1914,” in Peter Mathias and Sidney Pollard (eds. ), The Cambridge Economic History of Europe. Volume VIII. The Industrial Economies: The Development of Economic and Social Policies. Cambridge University Press, Cambridge. 1–160. Feldenkirchen, W. 1999. “Germany: The Invention of Interventionism,” in J. Foreman- Peck and G. Federico (eds. ), European Industrial Policy: The Twentieth Century Experience. Oxford University Press, Oxford and New York. 98–123. Henderson, William Otto. 1975. The Rise of German Industrial Power, 1834–1914. University of California Press, Berkeley. List, Friedrich. 1856. National System of Political Economy. J. B. Lippincott & Co. Philadelphia. Skarstein, Rune. 2007. “Free Trade: A Dead End for Underdeveloped Economies,” Review of Political Economy 19.3: 347–367. “The trade agreements that the United States has negotiated over the last three decades have been about getting low cost auto workers, steel workers, and textile workers. In addition, immigration policy has been designed to ensure that custodians, farmworkers, and dishwashers all work for low wages. These policies have been successful in pushing down wages for large segments of the work force, not only those who were directly displaced by trade or immigrant workers, but also those who face heightened competition from workers who were displaced by trade or immigration. But trade does not have to depress the wages of less-skilled workers. Trade agreements can also be structured to get us low cost doctors, lawyers, accountants, economists, reporters, and editorial writers. There are tens of millions of smart and energetic people in the developing world who could do these jobs better than most of the people who currently hold these positions in the United States. And they would be willing to do these jobs for a fraction of the wage. Real free traders would be jumping at this opportunity to increase economic growth and aid consumers in the United States, while at the same time increasing prosperity in developing countries. But the economists, editorialists, and political pundits are not likely to raise the call for eliminating the barriers that prevent competition from professionals in the developing world. The truth is that the ‘free traders’ don’t want free trade – they want cheap nannies – but ‘free trade’ sounds much more noble.” (Baker 2006: 26–27). Of course, even some of these people are starting to feel the effects of mass immigration on their employment prospects too, but Dean Baker’s general point still stands. Logically, free movement of people and open borders are the natural corollary of free trade, as Ha-Joon Chang has noted here. But your average idiot neoclassical economist has nothing to say about this. The small fringe of hard libertarians and anarcho-capitalists love open borders, not least of all because they see (correctly) that it would destroy the welfare state. Unlike Baker, however, who does seem at one point to endorse mass immigration of some Third World professionals to the West (Baker 2006: 103) to lower costs and increase supply, I don’t think this can be a sensible solution. The long-term solution is: educating more people in the West to overcome any supply issues with, say, doctors or health care professionals. “Here’s an interesting something that I’ve been talking about with people recently: maybe the cultural left is actually PART OF neoliberalism. I started thinking this after the Brexit debate. I hang around in London finance circles and what struck me was that the exact same rhetoric that was being used by the cultural left types on my Facebook feed was being used by the finance people. It was 100% identical. Right from the anti-democratic tone to the complaints about racism and all that. 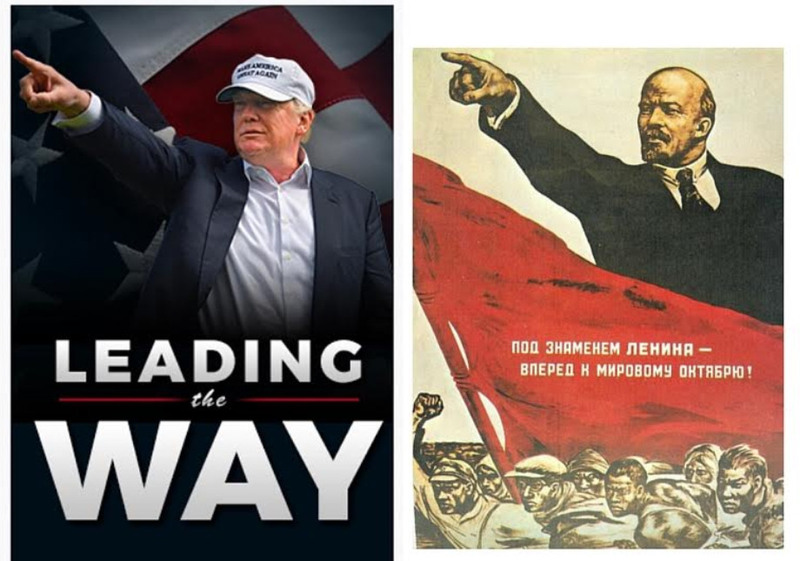 I think that both of these groups are actually the same people. They’re sort of embodied in that person who you actually see an awful lot: the Guardian reader who voted Thatcher/Major/Blair/Cameron. There are literally tons of these people. They care about the ‘environment.’ They want open borders and free trade (although they’ll buy fair trade coffee to boost their egos). They strongly dislike high taxes – especially when they are at the stage in their careers (aged 35+) when those higher tax rates impact them. They dislike poor people and think that anyone who works for a living is a racist. But they generally support welfare handouts much in the same way as Victorian snobs supported soup kitchens; so long as the poor stay poor and exercise no social control they make nice pets. Now I assume these people are a few late Baby Boomers (the old ones), Generation Xers, and some early Millennials (born in the 1980s and early 1990s). The trouble is that the same cultural leftism infects the Millennial generation too, and they seem more left-wing on economics. And I have a hard time believing the extreme SJW mentality that many of the Millennials have is found amongst these middle class, elite Baby Boomers and the younger Generation Xers. So I think it is better to say: the people whom TheIllusionist is talking about here are one important wing of the cultural left/liberal cultural left, the neoliberal wing. They are no doubt a natural constituency for neoliberal economics. The other wing is the millennial generation, who, by contrast, are more left-wing on economics. In one respect, it’s true there’s an awful lot of hypocrisy about welfare from big business, since wasteful corporate welfare is pervasive in our societies. On the other hand, some aspects of business welfare are actually sensible and justifiable, even in a social democratic nation. E.g., agricultural protectionism. It is well known that you simply cannot have a productive, stable agricultural sector in a true free market, because wild and violent swings in the prices of commodities destroy agriculture and send farmers bankrupt, a process which smashes up and ruins your agricultural sector and forces you to rely on imports. The truth is: a real free market in agriculture for most nations is stark, raving mad – and everybody sensible knows this perfectly well (even conservatives). So what you generally need for agriculture is: sensible protectionism (when needed), commodity stabilisation programs, and production quotas and so on, in order to stabilise markets, supply and profits. Perhaps even subsidies if things get bad for farmers. 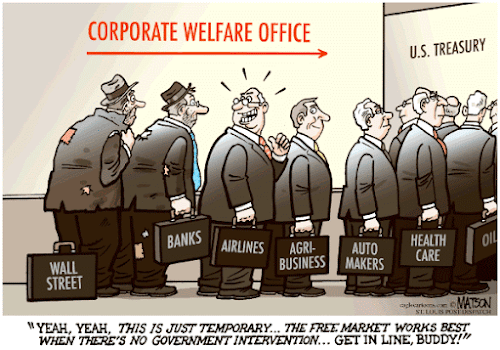 Bottom line: not all business welfare is bad. Some of it is actually OK, e.g., like agricultural protection, certain industrial subsidies, and a large stock of government debt that is actually a good thing that stabilises the financial sector and provides a safe asset for banks and corporations to buy. Trump and his Conservatives just Stole our Economics, People! Just look at Pat Buchanan and Sean Hannity on – WTF?? – Fox News partially steal the Left’s agenda on economics, as they talk about the poisonous disaster of free trade, outsourcing, loss of manufacturing, the decline of the middle class, and mass unemployment in America. Just listen to Pat Buchanan praise Bernie and Ralph Nader at the end! The world has turned upside down. This is why we need a reformed left, friends. (1) do you think left-wing politics is fundamentally about good economics? Do you think we need full employment, Keynesian macroeconomic management of our economies, a high wage economy, and an end to offshoring of our manufacturing and service jobs to the Third World by treasonous corporations and neoliberal governments? (2) are you a Bernie Bro who loved Bernie’s economic policies but thought the Social Justice Warriors (SJWs) were unhinged? (3) are you tired of Postmodernist B.S. and being told that there is no such thing as objective truth or that “all cultures are equal”? (4) are you tired of making excuses for SJW insanity and the craziness of identity politics? (5) are you tired of Postmodernist leftists bashing “white male science”? (6) do you think leftists who conflate culture with race and who then scream “racist” at any sensible criticism of bad cultural ideas are really stupid? (7) are you tired of hearing how wearing sombreros, “culturally insensitive” Halloween costumes, or doing yoga are supposedly “racist” and “cultural appropriation”? (8) have you had enough of hearing bizarre anti-white conspiracy theories from the regressive left that blame all our problems on the capitalist, white-male patriarchy and universal “institutional racism”? (9) are you fed up with the hostility to free speech on the Left and its quasi-McCarthyite culture of political correctness? (10) do you think some of the ideas of vicious, man-hating Third Wave Feminism have become unhinged? (11) are you tired of hearing that Islamist terrorism has “nothing to do with Islam”? Are you getting sick and tired of the excesses of fundamentalist Islam in our societies? (12) do you think – just like Bernie Sanders – that open borders is a lunatic, libertarian idea? (13) do you think endless mass immigration to the West is ridiculous, out of control and not in our interests? (14) at the same time, do you also hate those crazy libertarians, anarcho-capitalist nutjobs and conservative neoliberal vandals? My friends, not only are you not alone, but there’s nothing wrong with you! YOU are the future of the Left, not the regressive left or SJW loonies. We need to take back control of the Left, reform it, and in the process rebuild the power and popularity of the Left – and so that the populist Conservatives do not sweep into power in the coming years. Time to speak out and challenge other Leftists on their B.S. I bet we can convert most of these people too once they see sense. Try speaking out on the issues one small step at a time. Do it diplomatically, in a measured, friendly way, and in a way that shows how we can defend our beliefs on perfectly good left-wing grounds. Labels: Sick of the Neoliberal Left and Regressive Left? Good fun. The comments on Singapore are also very interesting. Labels: Ha-Joon Chang: Economics Is For Everyone! 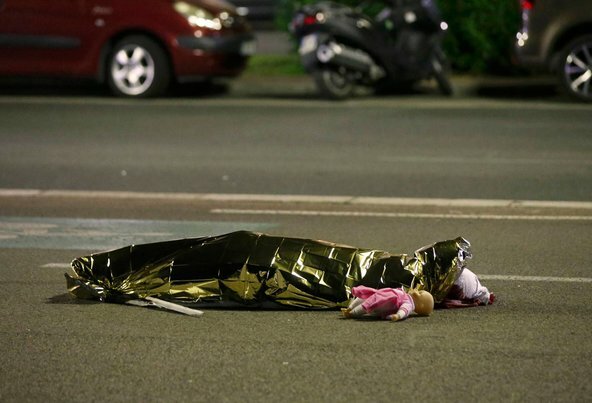 So once again Europeans have seen another vicious, grotesque terrorist attack in the heart of Europe. Even one picture here speaks a thousand words about this monstrous horror. See here and here. If things go on like this, it seems France may well face a permanent state of emergency. If it gets much worse, it will be more like low level civil war in a major European country. As Europe descends into chaos, even millennial cultural leftists and other regressive left lunatics will have to face reality, and this is the issue that will bring many of them to their senses. (1) isn’t EU open borders, or open borders of any kind, insanity at this point? I imagine even many left-wing people, even some of the regressive left, must be quietly asking these questions. Regressive leftism will implode over the coming years as people, especially the young, see how catastrophic cultural leftism and multiculturalism have been. Many will no doubt feel angry and betrayed when their utopian delusions implode. When this happens, I honestly hope these people will not defect to the right. They will need a sensible but hard-headed left-wing politics to fall back on. People who can intelligently point out what went wrong, without pushing conservative economics or the standard right-wing agenda. It’s time to build that alternative leftism. And, yes, I hope it will look like the version I have outlined at the end of this post. I fear that the identity stuff will actually proliferate more and more [sc. amongst millennial cultural leftists]. It probably won’t take over the economic radicalisation that is occurring. I think that will stay. But it will greatly impair their ability to govern. They will hold fast to fringe causes that will alienate the rest of the population. As I think is happening in Canada. The question of the commitments to these causes is interesting. Many started as genuine issues that, while I won’t go as far as to say they were civil rights issues as they are currently advertised, were pretty close to. So, gay rights pre-1967 was a genuine issue. I think it remained an issue during the AIDs pandemic of the 1980s. But today it has morphed into something else. It now seems to be an ideology in and of itself. Strangely it does not appear to be an ideology designed to do anything except hassle people who don’t conform. So we see all these stunts about wedding cakes in the US. As this is pushed to its limits the cultural left start to try to find ever more fringe ‘identities’ and promote these, also misleadingly as civil rights issues. The question is: why? I’ve come to think that this is a new form of morality. It really is about separating society into ‘good’ and ‘bad’. The ‘good’ support these causes. The ‘bad’ are painted as evil, hateful people – usually racist, misogynistic, backward and so on. They are not just wrong. But actively evil. By this reading the causes that are sought out don’t matter much in and of themselves. So long as they annoy the ‘bad’ Other they should be actively pursued. The ideology seems designed to be divisive and is really all about painting the adherent as (i) virtuous and (ii) engaged in something resembling a ‘moral war’. I’m sure that these sorts of politics lift peoples’ self-esteem but they are anti-political in the sense that they are geared toward alienation of the Other. Yes, there is a lot of truth to this. TheIllusionist has put his finger on a lot of good points here that need to be said. I only disagree on one point: I think the regressive left is doomed to collapse, and the Left will radically reform soon, maybe within the next 10 years. As young leftists age, they will come to see how stupid, petty, irrelevant and even unhinged most of their current cultural leftist concerns are now. To be clear: I think the Old Left from the 1940s to the 1950s had a lot of things right (certainly on economics), and only needed moderate reform on certain social and cultural issues. Take gay rights: the active persecution and criminalisation of gay people was cruel and immoral. Take the case of Alan Turing. But now the regressive left has turned gay rights into obsessive gay identity politics, and totally trivial things – like the refusal of some conservative Christian baker to bake a gay wedding cake – are treated as the second coming of Adolf Hitler. The regressive cultural left is often about virtue signalling and a Stalinist culture of political correctness to demonise not just conservatives, but even leftists who profoundly disagree with the excesses of cultural leftism. This is certainly a possibility, and the new populist Right has clearly taken a lurch in this direction. It’s well known that, say, Marine Le Pen has transformed the French National Front (FN) into anti-EU, anti-neoliberal, protectionist party. I think perhaps other populist European parties could be described as broadly social democratic on economics (e.g., the Danish People’s Party or Sweden Democrats? ), though I could be wrong on this. But the rest of them seem to be neoliberal or even libertarian on economics, e.g., UKIP or Alternative for Germany (AfD). I’m not holding my breath for these parties or even the mainstream Conservative parties to come around to sensible interventionist economics, or to speak sense on economics given their libertarian fringes. In the end, I think it might be quite likely that the left can and will reform itself. That means throwing out all the regressive left insanity. (5) it will totally re-assess the ideas of Third Wave Feminism, many of whose ideas will have to go. (7) it will be anti-imperialist and non-interventionist on foreign policy, but not isolationist. Anyone proposing any military intervention in the Third World would require a brutally strong burden of proof and anything proposed must be legal under international law. Paradoxically, anti-imperialism would require confronting and countering the brutal aspects of Chinese imperialism in the Third World. I would be happy to see a Left like this by the 2020s. As we can see, the really significant fall in the birth rate in Western nations like Germany and Britain happened from c. 1875 to the early 1920s. This was long before the social and cultural revolution of the 1960s. So what caused the fall from the late 19th century? “The minister cannot be ignorant that an alleviation of duties on India muslins and callicos, or giving encouragement to them by laying a heavier tax upon the cotton goods of this country, especially upon the infant manufacture of muslins and fine callicos, must depress and discourage the industry and ingenuity of our manufacturers at home, and have the strongest tendency to promote the sale of such foreign fabrics, in preference to those of Britain; that such a preference must soon be attended with evident injury to the public interest, as well as to the private trader, is too conspicuous, to admit of the verbosity of ratiocination.” (Wright 1785: 9–10). By the 1840s and 1850s, these British cotton textile manufacturers had become converted to the religion of free trade, under the influence of Classical Political Economy, and had forgotten that they or their ancestors had been vehement protectionists. In this election the Labour party won 1.5 million more votes than the Conservatives and received more votes than in the 1945 election, but owing to the first past the post system only won a majority of 5 seats. To be perfectly clear: I don’t like Enoch Powell or the politics he represented, but surely people on the left can look carefully at this piece of history and learn something from it. It seems pretty clear that to me that the “Rivers of Blood” speech poisoned any rational or sensible debate about immigration in Britain for years and years by focussing on race, and perhaps Britain is only just coming out of this now. In this sense, Enoch Powell was a disaster for British politics. Admittedly, the fears about immigration in this period were exaggerated, given how little actual immigration was going on in the 1960s and given how low unemployment was. Yet even the low levels of immigration provoked an intense backlash back then. However, some evidence exists that the immigration fear was also partly a symptom of the discontent with the Labour party’s incomes policy and wage freeze from 1966–1967 (Lindop 1998: 84), which was seen as unfair. What can be said about Enoch Powell? I think he is a warning from history. If you have an elite grossly out of touch with what the majority of people want, people like Enoch Powell will step in. Was there anything positive about him? It’s clear that Powell – like Tony Benn – was a vocal opponent of Britain entering the EEC on democratic grounds, and you can’t really fault him for that. But that’s about it. I would regard this as another deeply troubling aspect of Enoch Powell: to what degree did he prepare the ground for Thatcherism and even shift some working class votes from the Labour party to the Tories? This also damns Enoch Powell in my book: a race-baiting disaster of a man who destroyed any hope for serious debate on mass immigration and a crackpot free marketeer to boot. (1) Classical liberalism of the 19th century was a left-wing movement, when placed on the political spectrum of that era. It follows that a major strand of the left was strongly in favour of laissez faire capitalism in the 19th century. (3) The Old Left of the early and mid-20th century was, more or less, socially conservative (with a Bohemian fringe) and strongly opposed to mass immigration. In fact, outside of Europe, in Canada, America, Australia and New Zealand, the trade unions and labour-based parties were easily the most vocal and hostile to mass immigration precisely because it undermined labour rights, working conditions, and wages in the colonies. (1) old-style, laissez-faire capitalism is associated with the Right and what used to be called Classical liberalism is essentially a form of libertarianism, which is generally grouped with the political Right. (2) Conservatism has been largely taken over by the neoliberal or Thatcherite vision of capitalism since the 1970s, and the left-wing political parties have been converted to neoliberal-lite economic policies since the 1970s. (3) The Left is now extremely liberal or even quasi-libertarian on cultural and social issues and, at least amongst the elite and middle class representatives of it, strongly in favour of mass immigration. Jones, H. S. 2000. Victorian Political Thought. Macmillan, Basingstoke. I include the odd useful and relevant neoclassical work too. Meoqui, Jorge Morales. 2011. “Comparative Advantage and the Labor Theory of Value,” History of Political Economy 43.4: 743–763. Schumacher, Reinhard. 2012. Free Trade and Absolute and Comparative Advantage: A Critical Comparison of Two Major Theories of International Trade. Universitätsverlag Potsdam, Potsdam.